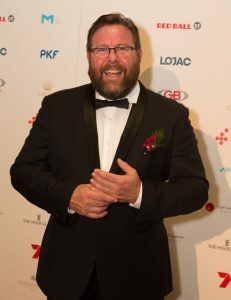 Shane Jacobson on the red carpet at the Red Ball, Credit: Fiona Hamilton. SHANE Jacobson is confident doctors will soon find a cure for cancer. The actor and comedian stepped out in Melbourne on Saturday night to host and celebrate the 25th annual Red Ball, a fundraiser for the Fight Cancer Foundation. The Red Ball has raised more than $6 million dollars across its history to support cancer patients undergoing treatment and their families. “I think every person on earth knows that cancer is one of the only things on earth that is non-racist,non-sexist and non-discriminatory”, he said. 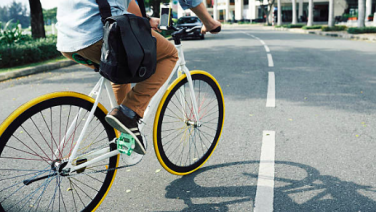 Jacobson celebrated the work by doctors and medical researchers. He said, “there are some incredible people in the world doing incredible work. 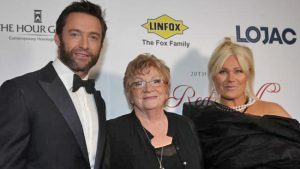 Hugh Jackman and Deborra-Lee Furness pictured with Deb’s mum Fay Duncan at the Red Ball in 2013, Credit: News Corp.
Jacobson, a guest at the Red Ball in recent years, was handpicked by Hugh Jackman and Deborra-Lee Furness to host this year’s event. 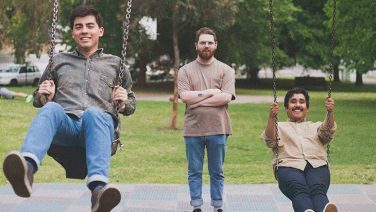 The high-profile couple are patrons of the Fight Cancer Foundation, and Deb’s mum, Fay Duncan, was one of the founding members of the Red Ball. She passed away just over 12 months before this year’s silver jubilee after a long battle with illness. She was 81. Jackman and Furness were unable to attend this year’s event, but recorded a video message which was played on the big screen on the night. 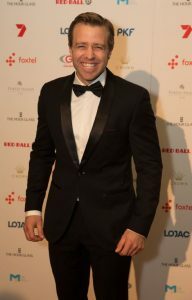 Jacobson said he could not pass up the opportunity to host what is regarded as one of Australia’s biggest charity events. “Hugh asked me if I wanted to host the event and I was more than happy to oblige. Who would want to say no to the wonderful Hugh Jackman and the lovely Deb-Lee Furness?”, he said. Jacobson was joined at the event by a host of local celebrities including Gamble Breaux, Pettifleur Berenger, Susie McLean, Simon Gleeson, Julia Morris and Jo Hall. He said it was great to see that so many celebrities are willing to give up their time to help raise funds to support the Fight Cancer Foundation. Susie McLean pictured on the red carpet at the Red Ball, Cr edit: Fiona Hamilton. 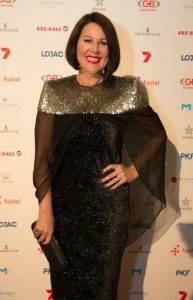 Julia Morris pictured on the red carpet at the Red Ball, Cr edit: Fiona Hamilton. Simon Gleeson pictured on the red carpet at the Red Ball, Credit: Fiona Hamilton.